That question has been asked quite frequently of late via emails, calls and social media. 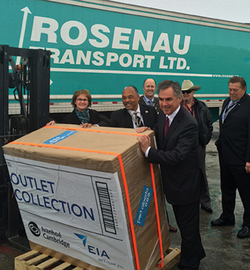 A fact shared at the podium of a recent press conference hosted by EIA (Edmonton International Airport) to celebrate its two new mega projects, the Collection Outlet Mall at EIA and the Rosenau Distribution Centre. In a huge, brand-new hangar awaiting its first tenant, EIA management hosted an afternoon event attended by nearly one hundred community leaders and government officials, retail moguls, business investors and eager reporters of the provincial media. Visibly thrilled with this momentous occasion, the EIA’s dynamic Communications Director Heather Hamilton warmly greeted guests and kept a sharp eye on the gathering. Finally, a special guest and his entourage arrived. The Alberta Premier, Honorable Jim Prentice joined the large gathering to offer his greetings on this milestone day. He commended the EIA and the developers for their vision and investment in these projects, a testament to Albertans’ confidence in the future and their strong entrepreneurial spirit, also creating jobs and new opportunities. These two projects represent a $25 million investment to the region, will enhance traffic and business to the Edmonton region and will create 1,000 jobs. EIA president and CEO Tom Ruth was visibly proud and happy to introduce these three partners: Ivanhoe Cambridge, Rosenau Transport and Panattoni Developments. Sharing that these developments will be great for our Airport, our region and our province. Among the guest speakers, the theme was common; excitement about the world of opportunities created by the completion of a large, 100-brand retail centre, the Outlet Collection at EIA, scheduled to open in 2017 and developed by Ivanhoe Cambridge. Company Vice-president of Global Development, Paul Gleeson, was a brief and enthusiastic speaker announcing that this new retail project will cover 450,000 square feet, 65,000 square feet more than originally planned. A new shuttle service will create a convenient access between the terminal and the mall. Ivanhoe Cambridge is a $40 billion global developer with an impressive track record in the design, development and management of a large portfolio of retail venues, including Edmonton’s Southgate Centre. Its first Outlet Mall in Niagara-On-The-Lake opened in May 2014, has been über-successful since its first weekend. Ivanhoe Cambridge is also the owner of the Mills developments, such as Iron Mills near Balzac (ivanhoecambridge.com). The Outlet Collection at EIA will feature warm and modern fashion districts as well as dining and hospitality venues. Panattoni Development is a privately-owned company with an Edmonton-based head office, invested in projects in more than 275 Canadian cities. The company’s Western Canada Vice-president Brad Hoffman shared his enthusiasm for this project being a unique opportunity to partner with this large, dynamic airport. City of Leduc Deputy Mayor, Bob Young, shared that, “This is yet another event that reminds us of the great value of this thriving airport for our region and our province. The amount of growth and development planned for the next few years is simply amazing!” Councillor Mike Nickel offered congratulations on behalf of the City of Edmonton. The consensus is extremely positive. The completion of the Collection Outlet Mall and the Rosenau Distribution Centre will create more jobs, attract more visitors to the region and provide regional shoppers with a plethora of new shopping venues. Well done, EIA!